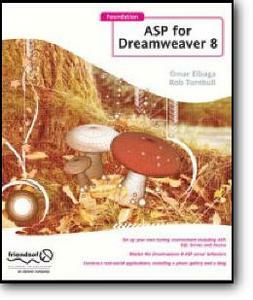 Do you want to learn about Microsoft's ASP and use it via Dreamweaver 8 to add the power of a database to your website? Use dynamic web forms to exchange data between you and your users? Build complete web applications? This book shows you how to do all that and more. Dreamweaver 8 takes a lot of the hard work out of performing tasks such as integrating a database into your website, but it can't do everything. That's why this book not only shows you how to use all of Dreamweaver's functions, but also shows you how the underlying code functions, so you can then work around Dreamweaver's shortcomings. There's no attempt to turn you into a code guru, but you'll come away with sufficient knowledge of basic ASP to have the confidence to dive into the Dreamweaver code and tweak it to your own requirements. The emphasis is exclusively on ASP, so you don't waste any time on information that's not relevant to what you want to do. Omar and Rob first take you through the latest version of Dreamweaver, and how ASP fits into it, then look in-depth at setting up your work environment – installing ASP, Access (and SQL Server), and the IIS web server, making sure they are all working together, and setting up a new web site via Dreamweaver. They then get to work, using several tutorials and real world examples, covering topics such as ASP Essentials (knowing what ASP code looks like,) working with forms, designing and implementing effective databases using Access and SQL Server, debugging and troubleshooting, and creating dynamic navigation, login, and search functionality.